Roller coaster through and around a Disney “mountain.” The idea is that you’re on a runaway mine train during the Gold Rush. We put this coaster at about a 5 on a “scary scale” of 10. 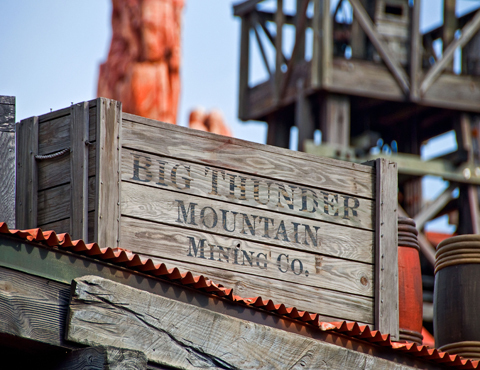 Big Thunder contains first-rate examples of Disney creativity: a realistic mining town, falling rocks, and an earthquake, all humorously animated with swinging possums, petulant buzzards, and the like. Ride it after dark if you can. Seats in the back offer the best experience. We love the interactive props in the queue. Spin a metal wheel and push on a dynamite plunger to trigger an “explosion” (of water, steam, or noise) near a passing train; watch “home movies” of the workers in the mines; see (and smell!) what some proverbial canaries experience underground; and more. Best of all, these toys are spaced just far apart for little kids to have something to do the entire time in line. Great thinking. A superb Disney experience, but not too wild a roller coaster. Emphasis is more on the sights than on the thrill of the ride. 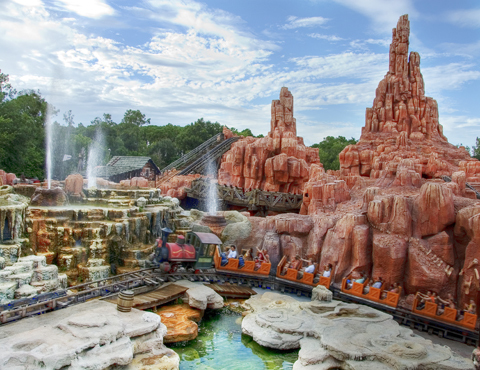 Nearby Splash Mountain affects traffic flow to Big Thunder Mountain Railroad—adventuresome guests ride Splash Mountain first, then go next door to ride Big Thunder. All this means large crowds in Frontierland all day and long waits for Big Thunder. The best way to experience both is to ride Seven Dwarfs Mine Train and Space Mountain one morning as soon as the park opens, then Splash Mountain and Big Thunder Mountain the next morning. If you have only one day, the order should be (1) Seven Dwarfs, (2) Splash Mountain, (3) Big Thunder, and (4) Space Mountain. If you're switching off on Thunder Mountain or Splash Mountain and have young kids to entertain, there's a fantastic little playground nearby where you can pass the time (and it's a great meeting place when the others get off the ride). It is completely covered and near the restrooms too! It's located next to Splash Mountain, under the train tracks. Being senior citizens and having limited time, my friend and I confined our activities to attractions rated as four or five stars for seniors. Because of your recommendation, we waited an hour to board the Big Thunder Mountain Railroad, which you rated a 5 on a scary scale of 10. After living through 3 1/2 minutes of pure terror, I will rate that attraction a 15. We were so busy holding on and screaming and even praying for our safety that we didn't see any falling rocks, a mining town, or an earthquake. 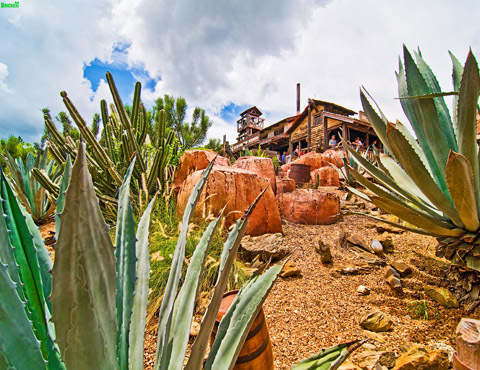 The Big Thunder Mountain Railroad should not be recommended for seniors or preschool children. Big Thunder Mountain Railroad was rated a 5 on the scary scale. I won't say it warranted a higher scare rating, but it was much higher on the lose-your-lunch meter. One more sharp turn and the kids in front of me would've needed a dip in Splash Mountain! However, a reader from West Newton, Massachusetts, dubbed the ride "a roller coaster for people who don't like roller coasters." This chart shows you roughly how long you'll wait for Big Thunder Mountain Railroad when you visit on a day with a given Magic Kingdom Crowd Level. The blue bars represent the average "peak" wait time (that is, how long the line will be at its busiest). The bottom and top black lines represent the range of peak wait times to expect (for you fellow nerds out there: it's the 5th percentile and 95th percentile of peak wait times). Please note that these are estimates, and for a better forecast for your travel dates, see Big Thunder Mountain Railroad Wait Times. 40" minimum height requirement; children younger than age 7 must ride with an adult. Switching-off option provided.